Elder statesman and leader of the South-South region, Chief Edwin Clark, has revealed the people who were allegedly behind the raid on his home. Chief Edwin Clark, an elder statesman and leader of the South-South region, has revealed the identity of top police officers allegedly involved in the raiding of his Abuja residence on Tuesday on information that he was stockpiling arms in his house. 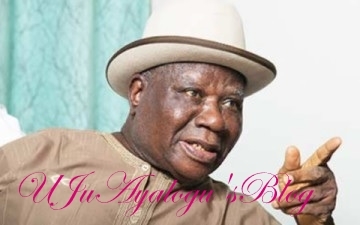 Clark, who is demanding a full blown investigation into the matter, named a Deputy Commissioner of Police, Yusuf Kolo, Commander of the Inspector General of Police (IGP) Tactical Squad and Assistant Inspector General of Police, Federal Intelligence, Umoru Usman as those who instructed the raid and search on his residence. According to Sun News, this was contained in two separate petitions addressed to President Muhammadu Buhari and the National Security Adviser (NSA), Major-General Mohammed Babagana Monguno (Rtd). In the petitions with reference number KACCL/ PET/KA/76/18, dated September 6, 2018 and signed by his lawyer, Dr. Kayode Ajulo, Clark said though he has accepted the public apology from the police, he want the matter to be thoroughly investigated. If you ask some of your colleagues, they will tell you that Kolo was at parade of suspect that Monday helps along the Abuja/Kaduna highway. He was within that vicinity and he was not in Abuja at the time. “So, we plead for more understanding from the elder statesmen. But we want Nigerians to know that Kolo was not behind it. If he has sent a petition, then the IGP will investigate but I want to make it clear to the public that we seek for more understanding from the elder statement that it is not Kolo that is behind it.